— A large sign outside the entrance to Space Center Houston promotes the six-story-tall centerpiece of the new Independence Plaza as "bigger on the inside." 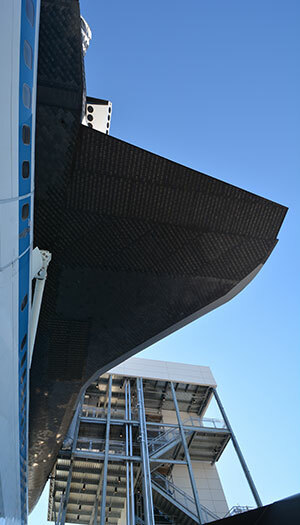 Starting on Saturday (Jan. 23), the public will have a chance to see for themselves as general boarding begins of the largest single artifact saved from NASA's space shuttle program: the original Boeing 747 jumbo jet that ferried the shuttle orbiters across the country between missions. 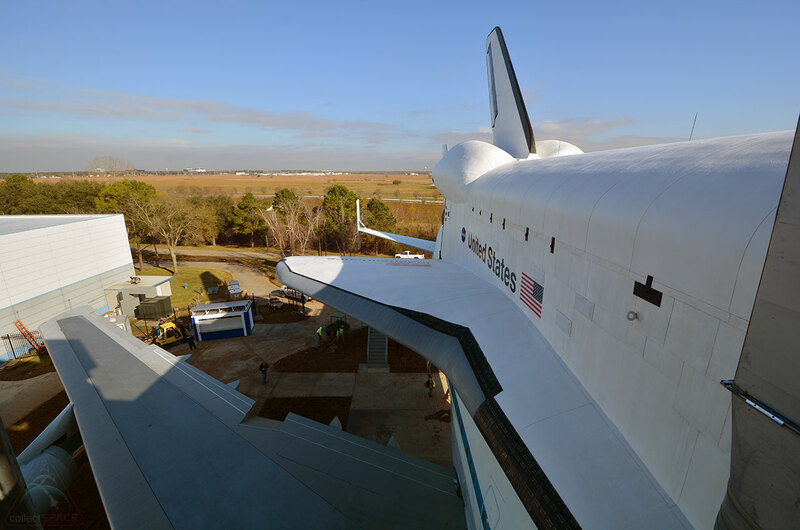 Making the 8-story-tall exhibit even bigger is the addition of a full-size space shuttle replica. 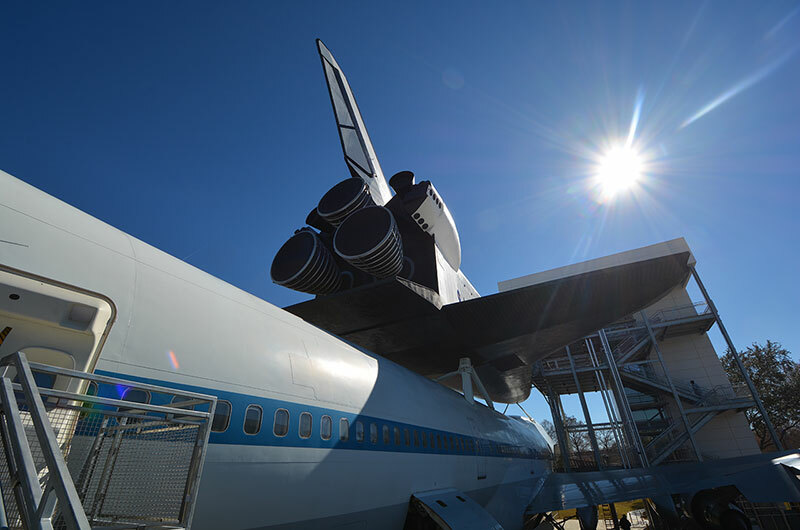 "It is a world-class [exhibit]," said Frank Marlow, who was among the NASA pilots who flew the Shuttle Carrier Aircraft. "It was such an honor to fly it." 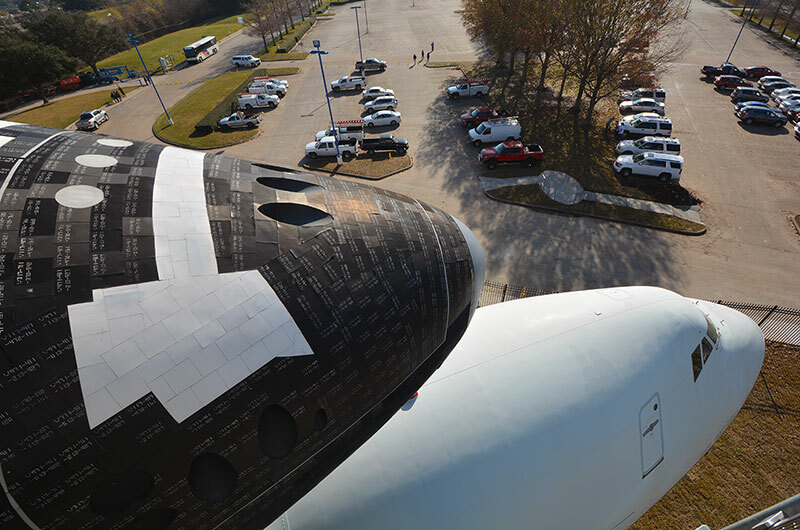 Almost four years in the making, Independence Plaza is the only place in the world where the public can see a (mock) space shuttle atop a Boeing 747 jetliner and be able to go inside both. 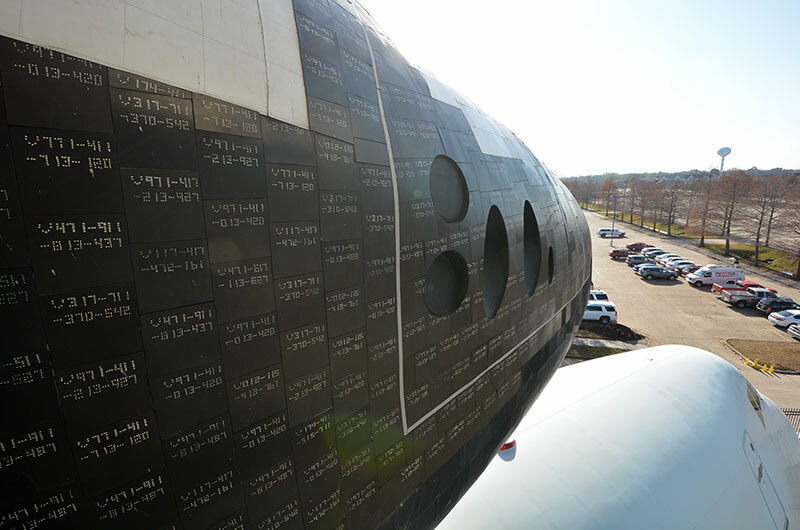 NASA's retired space shuttle orbiters and its second Shuttle Carrier Aircraft, NASA 911, are on display at other museums across the nation but those vehicles can only be viewed from their outside. 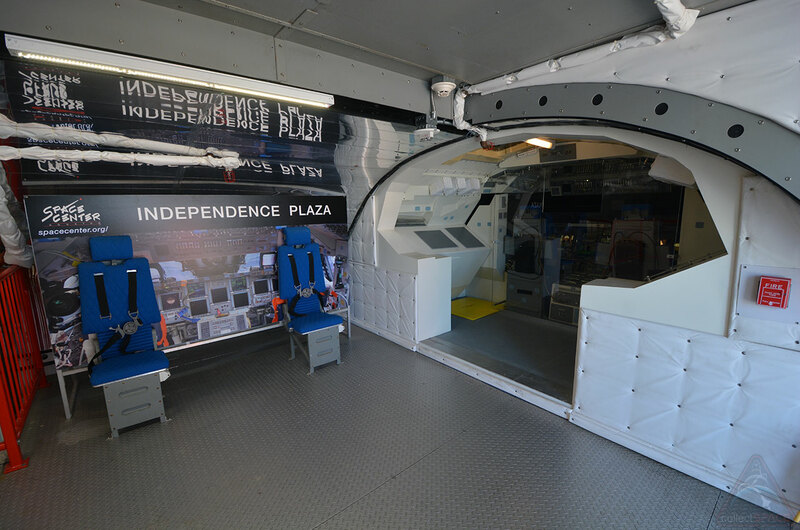 Inside the mock space shuttle Independence, guests can tour a detailed replica of the orbiter's two-level crew cabin. On the flight deck, they can see the controls the commander and pilot used to fly the shuttle. 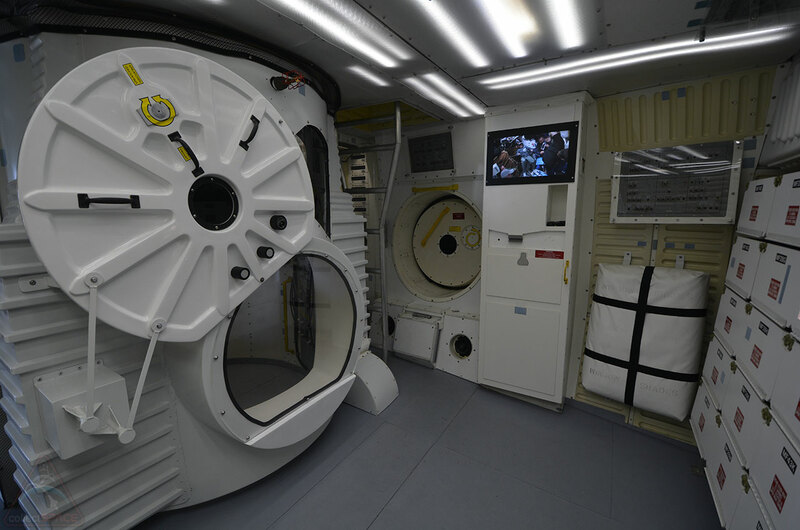 On the mid-deck, the public can enter where the astronauts lived, as well as walk into payload bay. A hands-on museum now fills the length of NASA 905's fuselage, providing guests with a look back at the history of the space shuttle and how a jumbo jet was able to fly the orbiters between the launch and landing sites. 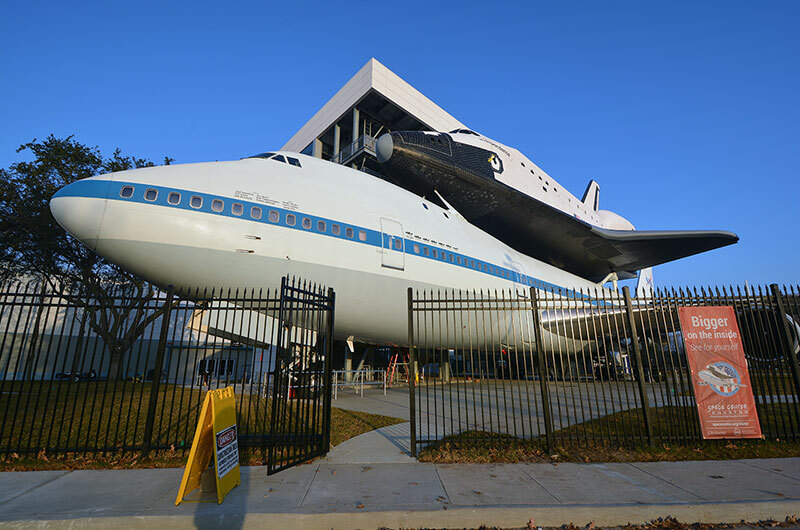 Visitors can try their hands at mating a shuttle atop a 747, run the aircraft and spacecraft stack through a wind tunnel and view the original flying scale model of the Shuttle Carrier Aircraft that convinced NASA a jetliner could carry an orbiter piggyback. 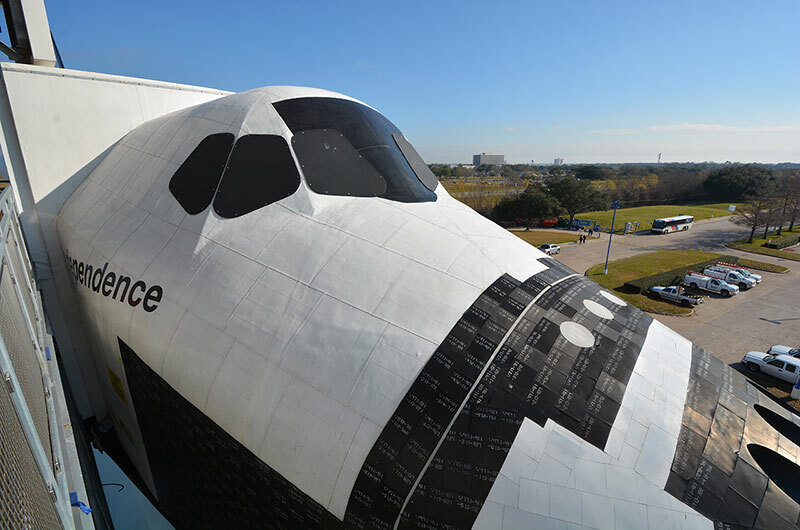 The eight-story-tall access tower that enables guests to enter both the aircraft and shuttle also offers panoramic views of NASA's nearby Johnson Space Center and the surrounding Clear Lake area in Houston. "Visitors will be a part of history entering this one-of-a kind exhibit," Richard Allen, the president and CEO of Space Center Houston, said. 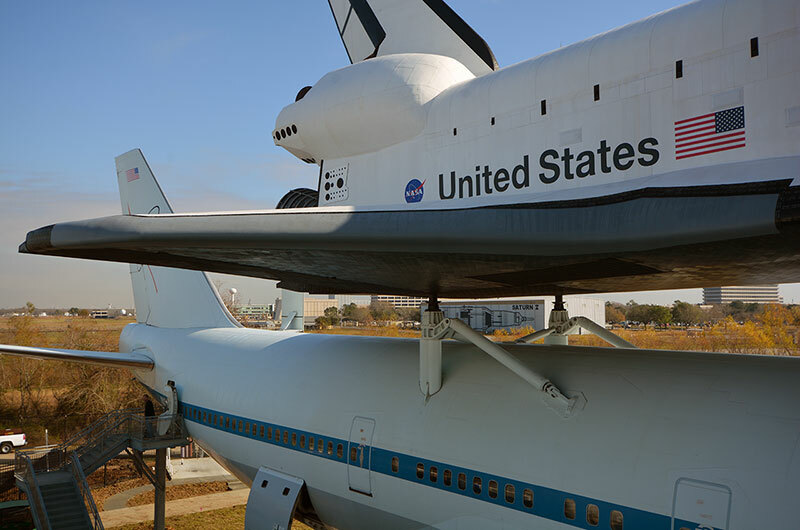 Independence Plaza at Space Center Houston is the only place in the world where the public can see a space shuttle (mockup) mounted atop a Boeing 747 jetliner. It is also the only exhibit where the public can enter both vehicles. 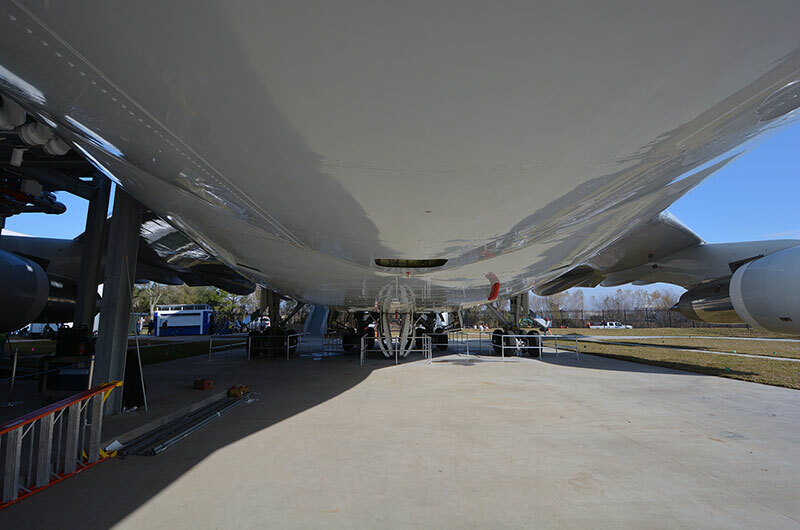 In addition to boarding the Shuttle Carrier Aircraft, NASA 905, visitors can walk around — and under — the modified Boeing 747 jumbo jet. Guests with timed entry tickets (required for the space shuttle Independence only) ascend to the top level first, providing an up-close view of the mock orbiter's nose and a scenic view of the surrounding Clear Lake area. Stacked atop each other, the Shuttle Carrier Aircraft NASA 905 and the mock space shuttle Independence stand six-stories tall. 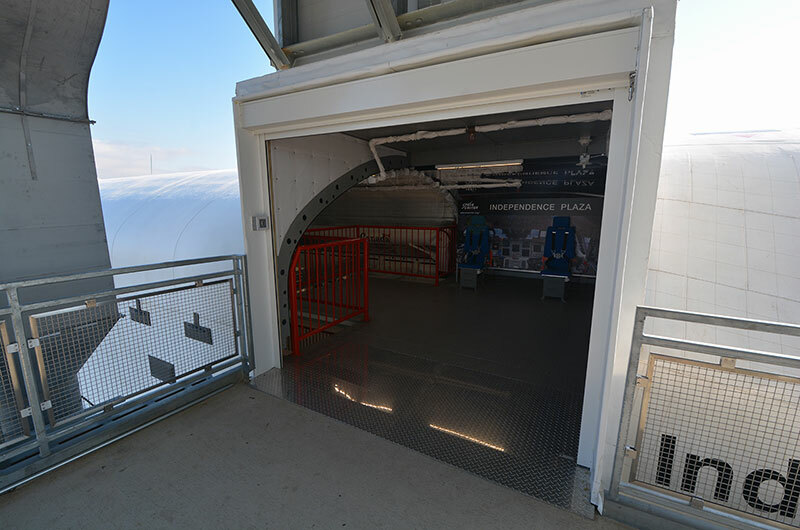 On this, the top level of the access tower, Space Center Houston guests can enter the flight deck level of space shuttle Independence. 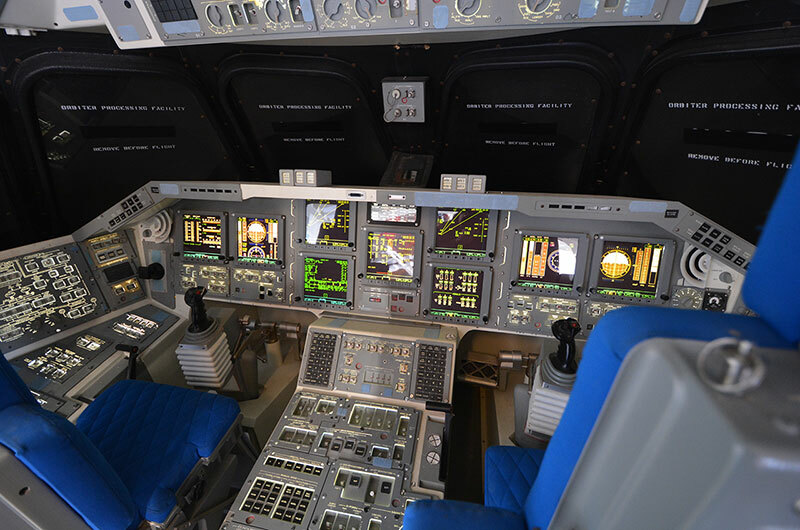 Touring this level, visitors can peer into a detailed replica of the flight deck, where the commander and pilot were seated to fly the shuttle, and then take a turn posing for a photo in replica shuttle chairs. The forward flight deck has been outfitted with a replica of the Multifunction Electronic Display Subsystem (MEDS), or "glass cockpit," that was used during the latter half of the 30-year space shuttle program. 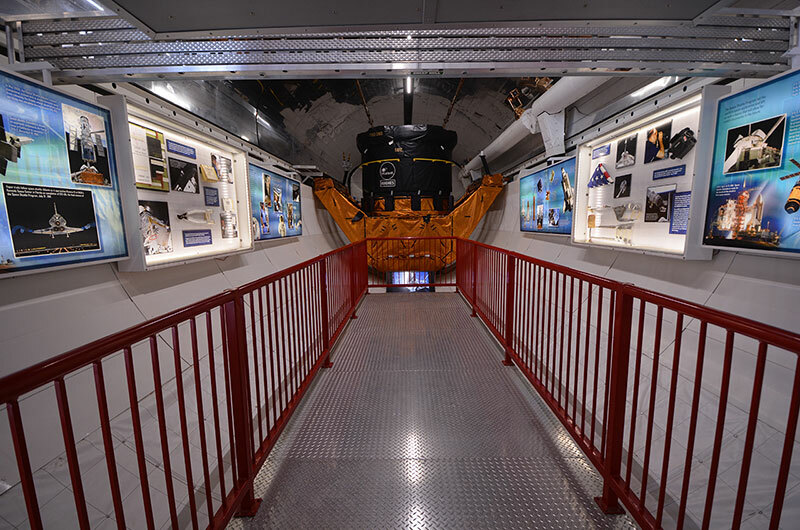 Descending to the mid-deck level of space shuttle Independence, visitors can get a better look at the side of the mock orbiter. When Independence (as "Explorer") was previously on display in Florida, the public could only look into the mid-deck. 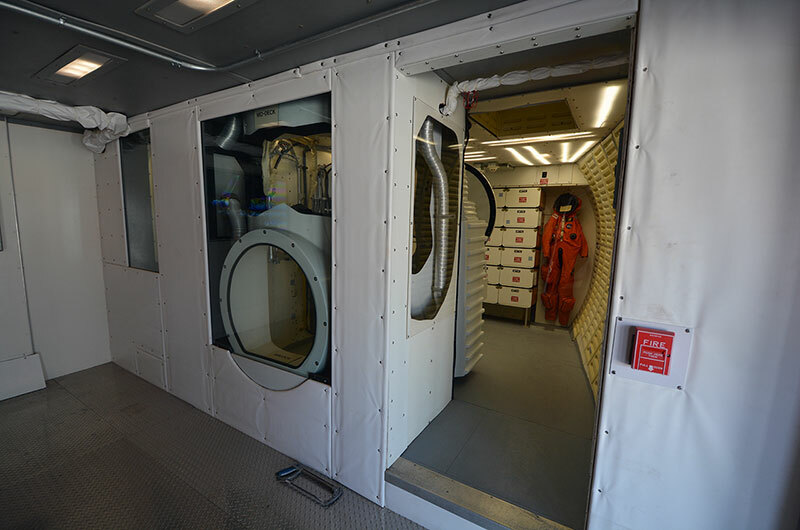 At Space Center Houston, guests can now walk into the crew cabin. 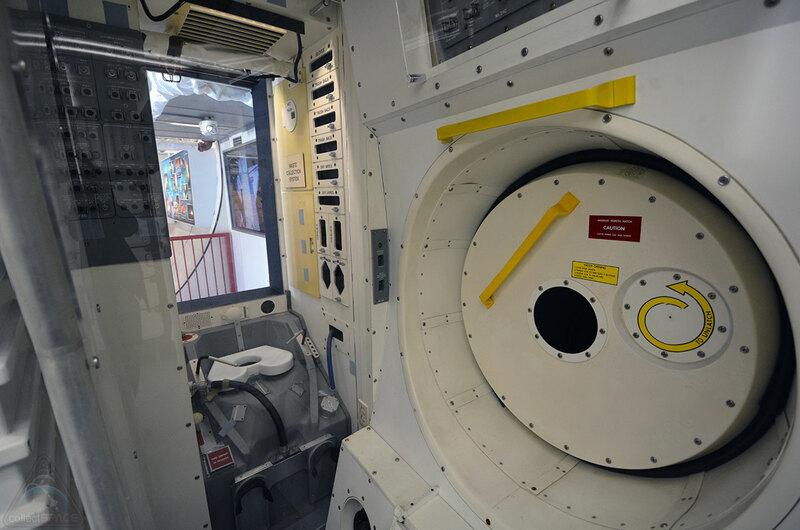 ...and, next to the crew access hatch, the waste containment system, or toilet, used by space shuttle crews. 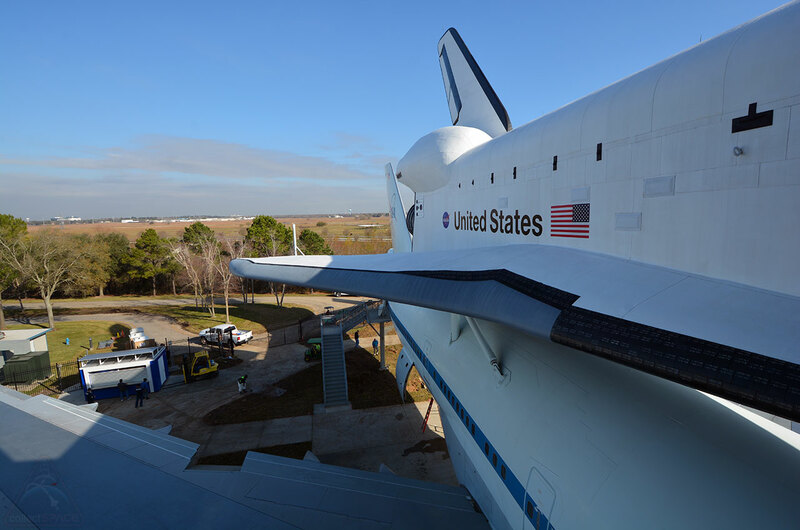 Also new to the Space Center Houston display is the ability to walk almost the full length of the 60-foot-long payload bay. 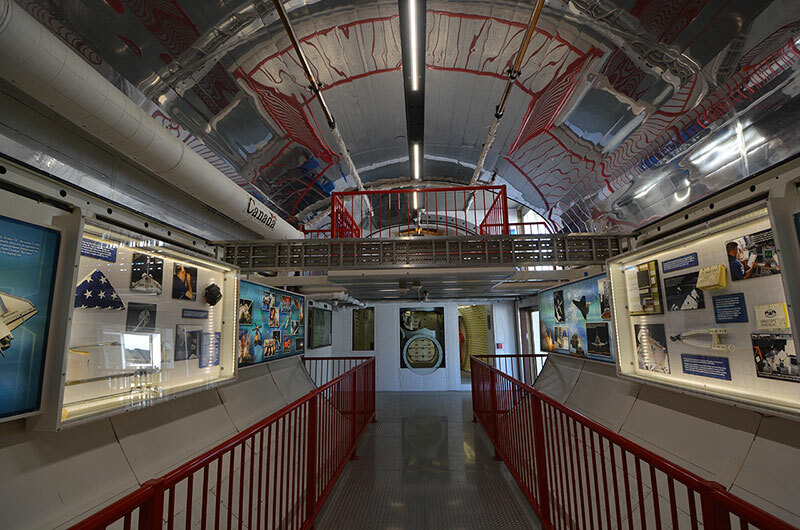 Authentic space shuttle artifacts are displayed along the walls and at the far end is the actual cradle used to secure an Intelsat satellite on the maiden flight of space shuttle Endeavour in 1992. 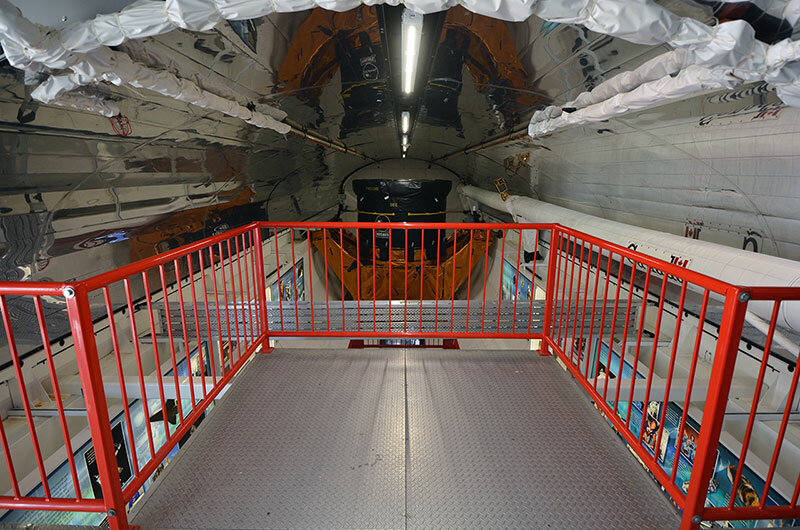 The mirrored ceiling is representative of the reflective radiator panels that were deployed when the payload bay doors were open in space. Guests enter Independence through a permanently-attached, two-level white room. On display in the plaza below though, is one of the two real orbiter access arms and white rooms that astronauts used to board the space shuttle on the launch pad (this one, from Pad 39B at the Kennedy Space Center in Florida, was removed in 2011 and was previously on display in Johnson Space Center's rocket park). 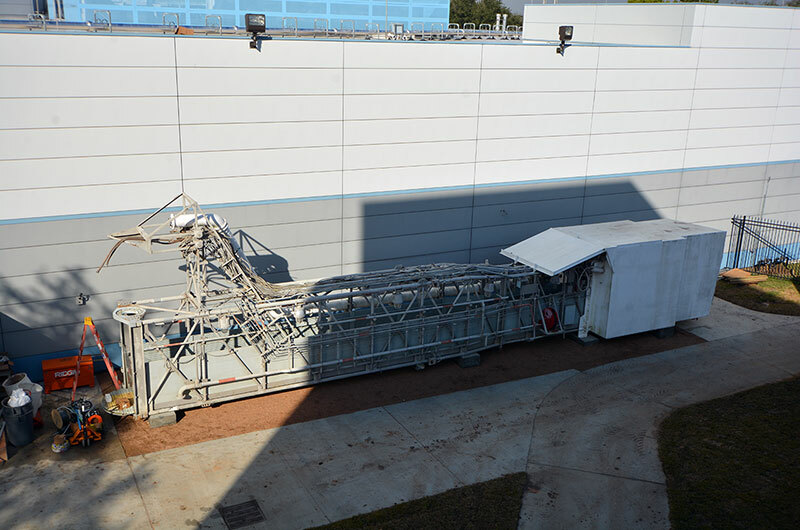 Speaking of the rocket park (see previous caption), at the NASA 905 entrance level, guests can catch sight of the building that houses one of only three remaining Saturn V moon rockets through the gap between the shuttle mockup and Shuttle Carrier Aircraft. 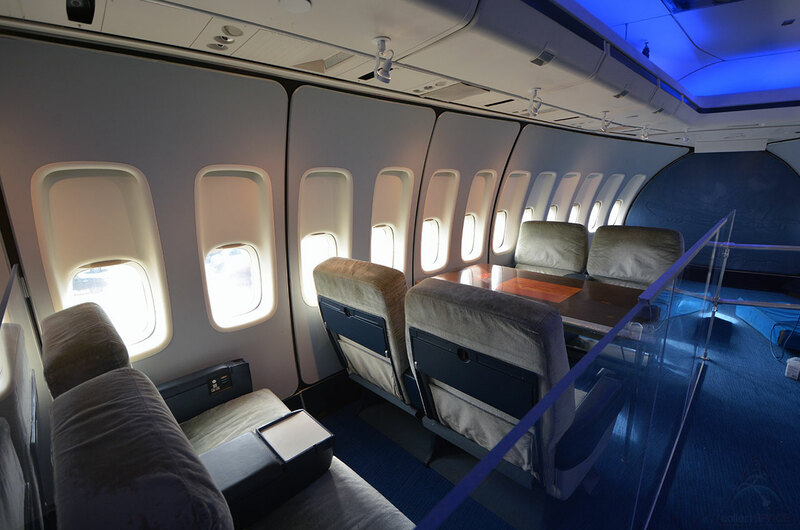 Most of the inside of NASA 905 has been converted to a hands-on museum, but guests can still see part of the First Class section that was left in place during the years the aircraft ferried orbiters across the country. 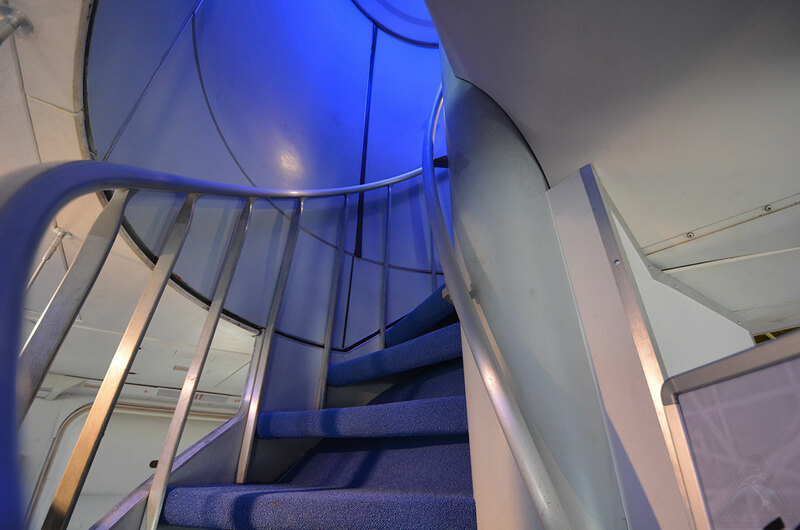 This spiral stairway leads up to the Boeing 747's cockpit. At least for now, guests will not be able to ascend these stairs but Space Center Houston is working on ways to make the cockpit accessible (either physically or through digital VR). 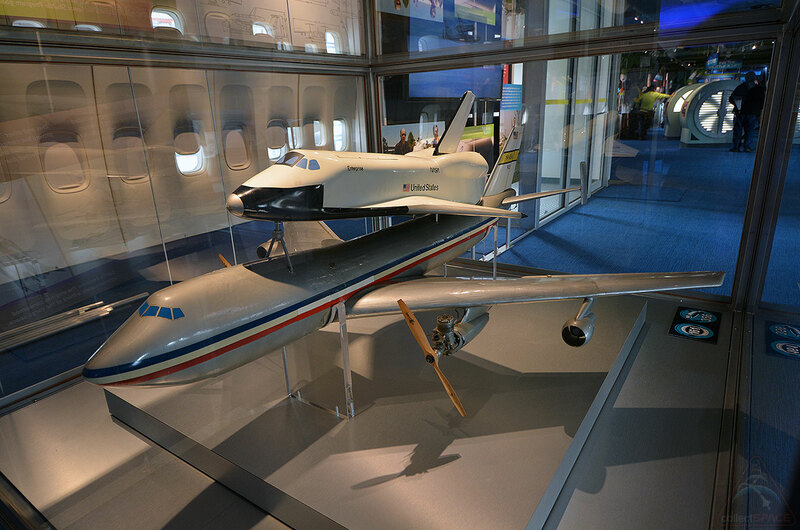 One of the first exhibits visitors encounter inside NASA 905 is the original radio-controlled scale model of the Shuttle Carrier Aircraft (SCA) that was instrumental in convincing NASA managers that flying a shuttle on the back of a Boeing 747 was feasible. Many of the NASA 905 exhibits are hands-on. 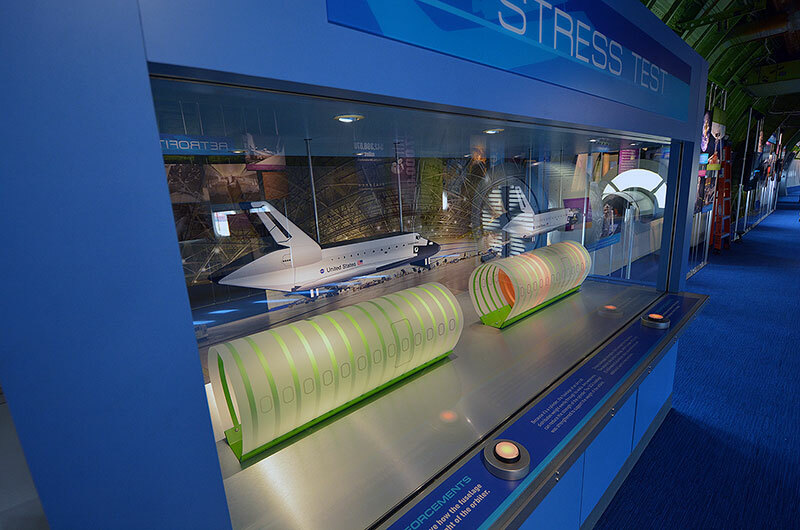 This display demonstrates why the jet's fuselage had to be reinforced to carry the shuttle. 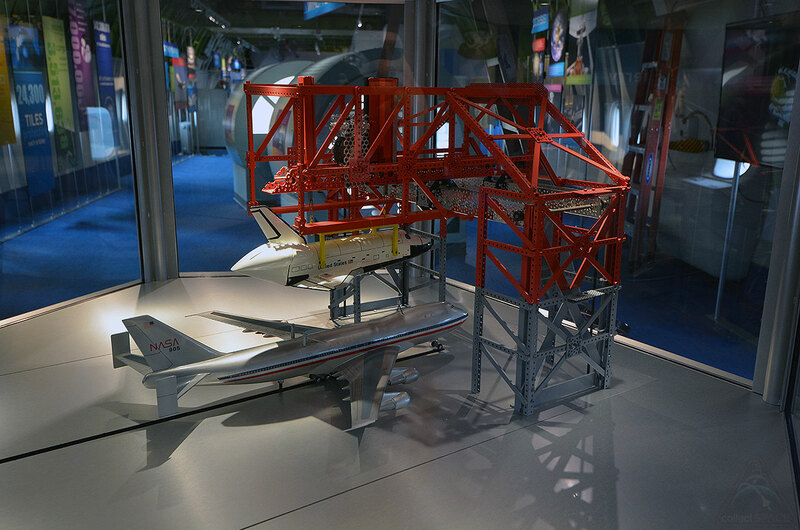 In this exhibit, guests maneuver a series of panels to align and lower the space shuttle onto the Shuttle Carrier Aircraft using a scale model of the Mate-Demate Device that was located at NASA's Dryden (now Armstrong) Flight Research Center in California. 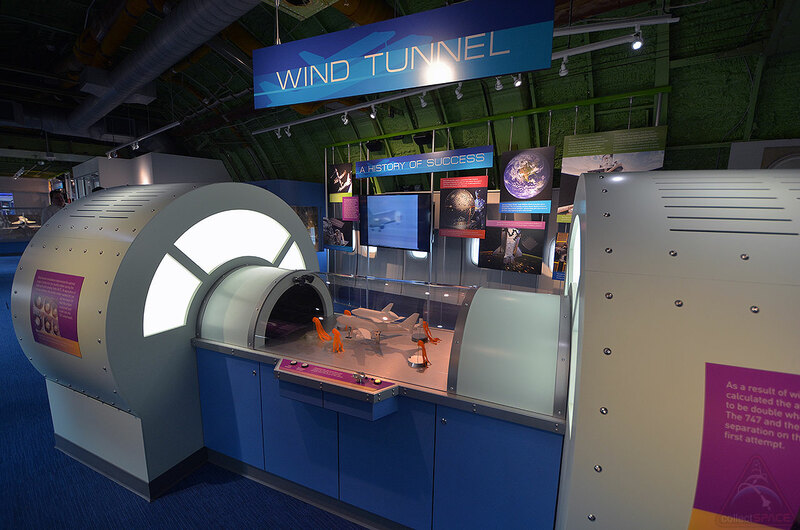 Another exhibit replicates a wind tunnel like the type NASA used to ensure the Shuttle Carrier Aircraft could fly safely with the shuttle.